If I have one guilty pleasure series, it’s Assassin’s Creed. Normally, I’m not one to get excited about yearly releases, let alone broken games. But I’ve played and mostly enjoyed every game in the series. Recently, I returned to Assassin’s Creed II, and, much to my surprise, I realized just how much I’ve lowered my standards since that game’s 2009 release. This piece originally appeared 1/27/15. The first hour of Assassin’s Creed II is a superb reminder of how great this series can be, providing a blueprint for future entries in the series. Let’s take a look back at it to see just why that is. Assassin’s Creed II’s intro is tight, focused, and charming. Ezio Auditore became the series’ face for years precisely because he was such a great protagonist. The game’s first several missions are essentially a training sequence. It is an absurdly short one by series standards, clocking in at less than an hour of game time, but it elegantly conveys all the information the player needs to know. More importantly, however, Assassin’s Creed II’s first hour gives the player motive—a real reason to take action in the game beyond the massive, pointless collectathon that overshadows more recent titles. Over the past few installments, Assassin’s Creed games have become bloated. What were short, hour-long training sequences are now drawn out into five or six hours of unmemorable sequences that often fail to adequately prepare the audience for the challenges ahead. The audience wants to have fun running around historic places and events, catching the sights and, occasionally, stopping bad guys. Ubisoft, it seems, hasn’t quite figured that out. Sure, the games are longer now, but not because they’ve become more substantial. Unity’s map is littered with breadcrumbs that lead nowhere. Go to the gold chest to get a bit of money and possibly a new shirt, or the blue chest, or the red chest, or the brown chest. Sometimes you’ll have to stop some guards. See that thing on the map? Well, if you’ve got the companion app on your phone, you can go touch it to add points there. It’s fun, sure. Eating popcorn is fun. But after playing Assassin’s Creed II again, I remember a time where I did things in Assassin’s Creed because I wanted to, not because some map markers demanded action. I remember when the series felt more like a balanced meal than a bucket of popcorn. We pick up right where we left off at the end of the first Assassin’s Creed. Lucy, a member of the eponymous Assassins, frees series protagonist Desmond from the Abstergo labs, where he’s been subjected to experimentation. The two flee to an Assassin base, where players are introduced to two new characters and the Animus 2.0. A surprising amount of cool stuff happens in just this short section. Most sequels have a tendency to change things up from their predecessors. One frequent change is the user interface, all those icons and overlays you see on the screen as you play. That happens in this sequel, too, though Ubisoft provides a simple explanation for the UI change by putting Desmond in another machine. Why do things look different? Well, Animus 2.0 shows them differently. That’s why. Additionally, Assasssin’s Creed II builds on the database entries of the first game; the game features more entries and more substance in each entry. There’s an in-game explanation for this, too. The transfer of the player to the Assassin hideout allows one of the new characters, Shaun, to add more personality and Assassin-centric information to the entries. Why would a Templar-centric database feature an Assassin-centric worldview? It probably wouldn’t, but a database written by Assassin member Shaun could. Again, the game makes changes that make sense It’s airtight. That’s all really neat, but I think the coolest thing this intro does is require Desmond to fight without actually teaching him how to do so. Because the combat system in Assassin’s Creed II is brand new, even veterans from the first game may find themselves off balance. With this simple yet clever twist, Assassin’s Creed II makes its players feel helpless, accentuating Desmond’s vulnerability. Many games begin with low-risk fight training. Maybe you enter an arena with a friendly ally who tells you what to do. Fable does that. Perhaps your first foes are wooden cutouts. That’s the approach in Call of Duty 4: Modern Warfare. Here, we’re put into a brawl and asked to use unfamiliar controls to fight our way out. The actual training comes later; for now, we’re mashing buttons. Sure, you can’t actually die here, but the game sets up this idea that Desmond doesn’t really know what he’s doing and he’ll need to learn, which is great, because that’s precisely what Lucy tells Desmond as they enter the Assassin facility. Desmond, of course, doesn’t think he can fight, but Lucy explains that he can, saying that the new Animus can teach him years of training in a matter of days. In other words, within a few minutes, the game moves the plot along while changing elements from the first Assassin’s Creed and introducing new elements. At the same time, it justifies or explains all of those changes. Then it sets up the external, out-of-the-Animus conflict of the series: the Assassins are low on time, and they need Desmond to learn from Ezio. Welcome to Renaissance Italy. Ezio Auditore steps into view boldly, calling out some guys for insulting his family name. We’ve walked into a gang war. Ezio is immediately charming, calling his foes out with an endearing confidence rather than impotent rage. They respond like the scumbags they presumably are, so we feel no qualms about roughing them up, especially after one of them throws a stone at Ezio, cutting his lip. Now the game actually teaches us to fight. Ezio is clearly a more experienced fighter than Desmond, though not by much—the game only just begins to introduce us to its bag of tricks. We learn quickly. Not a moment too soon, Ezio’s older brother, Federico, arrives. The fight ends, the crowd disperses, and Federico tells Ezio he should probably get his cut looked at. Ezio admits he has no money, to which Federico responds, asking if he spent it on wine and women. Narratively, Assassin’s Creed is giving us further insight into Ezio’s character: he’s a carefree young man. Mechanically, Ezio’s lack of money introduces us to a new mechanic: looting our foes after we’ve beaten them. It takes a few seconds, but we do it enough times that it’s ingrained into our muscle memory. Next, we go talk to Federico—learning how objectives work and how to activate them. He tells us to go to the doctor, which we do, learning the game’s trademark free-running mechanics in the process. Talking to the doctor is yet another moment of training, set up effectively by the story; we learn how to heal ourselves after a fight and what it will cost us. Within less than twenty minutes, we’ve been introduced to the protagonist of Assassin’s Creed II and learned the basic mechanics. The developers’ clarity of communication here is fantastic. After that, the game introduces several major characters. We meet Cristina, Ezio’s love interest, Giovanni, his father,, and the rest of his family. These characters have missions for Ezio. Each mission—whether it’s hunting down feathers for Petruccio, Ezio’s younger brother, beating up his sister’s unfaithful boyfriend, or carrying items for his mother—prepare us for the game ahead. But they serve a dual purpose. These missions also help the audience see what a loving family Ezio has. His life is a good one. Things seem as if they are going well, until a plot against Ezio’s father is revealed. and Giovanni, Federico, and Petruccio are hanged, with Ezio making a narrow escape. The villains of the game reveal themselves, even if Ezio does not fully understand who they are. Their actions set the rest of the game in motion. Within just one short chapter of Assassin’s Creed II, we’ve been introduced to a likable protagonist, learned his motivations, and been taught the basics of the game. It feels as if everything serves multiple purposes—a mission for Ezio’s sister, Claudia, teaches us about a type of mini-game, introduces us to Claudia, and helps us learn more about the kind of person Ezio is. The narrative and story are intertwined beautifully, and all the necessary information is conveyed with an economy not seen in the subsequent sequels. Playing Assassin’s Creed II again, I remember a time where I did things in Assassin’s Creed because I wanted to, not because some map markers demanded action. Take, for instance, Assassin’s Creed: Revelations. The introduction begins with an awkward attempt at imitating Uncharted 2, then transitions into what I believe is the longest training series in the entire game. Revelations introduces many new mechanics, from bombs to tower defense to to ziplines to the hook-blade, in addition to all the mechanics from Brotherhood. So much is introduced, and Revelations takes so long to do it, that it feels like the most bloated game in the series. Assassin’s Creed III spends so much of its time trying to pull a clever fakeout with surprise prelude protagonist Haytham Kenway that we spend hours meandering around before the “real” game begins. Then we spend several hours dealing with actual protagonist Connor Kenway’s origin story. We’re also re-trained in some mechanics, while new ones are piled on. It’s messy. Then, of course, there’s Assassin’s Creed IV: Black Flag, which featured a protagonist who did not care about the Assassins or Templars. That was a refreshing change of pace, but we found ourselves progressing through a story more because the map markers told us to go there than because the story did. Black Flag at least reduced the training bloat, though it still took several hours to get from the regular intro to the new, core ship gameplay. These post-AC II releases are still good games, but the 2009 sequel’s intro is far more focused and helps make it, overall, a tighter, better game. It conveys all the information you need as quickly as possible, then sends you on your way to really begin enjoying the game. Assassin’s Creed games aren’t the only titles that suffer from needless bloat and training, of course. The Legend of Zelda: Skyward Sword, for instance, was criticizedfor unnecessary, excessive hand-holding. But there’s another problem plaguing games today, including the Assassin’s Creed series, and that’s one of motive. If there’s one thing I’d like to see games do better, it’s motivating players to take action. Video games, after all, are about performing actions, so it stands to reason that the best video games would do their best to motivate players. Unfortunately, many video games I’ve played establish motive by simply putting a map marker where the player’s supposed to go instead of motivating them through the game’s story. Others attempt to set up a sense of mystery, but it’s usually something like “why am I the Chosen One who has to save the world?” or something of the sort. Some games resort to assumed empathy. You’ll care because you’re expected to care. If you don’t, tough. Imagine starting a game and being told “they took my family away from me. I want to get back to my family,”... and expecting that to connect with the audience. Without actually seeing the family and the relationship, without the narrative earning that desire to reunite a character with their family, we’ve got a hollow experience on our hands. The motives in Assassin’s Creed II are clear: someone has killed your family and gotten away with it. Not only that, but your family members were good and sympathetic people. There’s no assumed empathy here—we spent time with the Auditore family. We know they didn’t deserve the fate they received. Likewise, we know that the authorities were given information proving the family’s innocence and actively sabotaged it, because we delivered this information ourselves to a man who promised us that he would use it to free our family, then championed their hangings the very next day. We were there—it happened to us. The game makes no assumptions, instead putting us in the shoes of the victim, setting us on a course for revenge. Our motive is aligned with Ezio’s. The story works with the player, providing an impetus beyond simple map markers. Good motive is something I really want from story-driven games. I don’t want to have to chase down the guy who is supposed to tell me why I’m in the game in the first place. I don’t want to play an RPG where I’m working for some bad guys based on flimsy reasoning that say little beyond, “the universe is at stake!” I definitely don’t want to play a game where I’m trying to ‘reunite’ with a family I’ve never even met. I’ve played games that have made all of these mistakes. I want the game to work with me, to encourage me to do the things it wants me to do. I want personal reasons, rather than “you should go save the thing we’re telling you to save because the thing is important.” One game I played recently, Far Cry 4, actually had a character insult me, then order me on a mission that was totally out-of-character for her to do. She was demeaning and what she wanted made no sense, so why did I do it? Because that was the next thing to do on my to-do list. Providing a solid motive is the baseline for what any good game narrative should do, yet so many don’t. They resort to “find the maguffin” like AC: Revelations or III did, or the “I want money” of Black Flag. Good narratives establish good motive, and too many video games fail in this regard. The games that matter to me the most have been the ones that successfully connected these things, whether I’m playing a lone cop trying to make sense of a senseless, drug-fueled murder, a guy with writer’s block losing his supportive wife and trying to find her again, or a lone hacker just trying to survive on a spaceship populated by monsters. Assassin’s Creed II told a story that mattered. The entire game—and its sequel, Brotherhood—was about eliminating the Borgia family and finding justice for the Auditore family. I want to play games where the story makes my actions matter. All of this comes down to the opposite of bloat: focus. That’s what made Assassin’s Creed II, as sprawling a game as it was, so fundamentally strong. Things do change, of course. 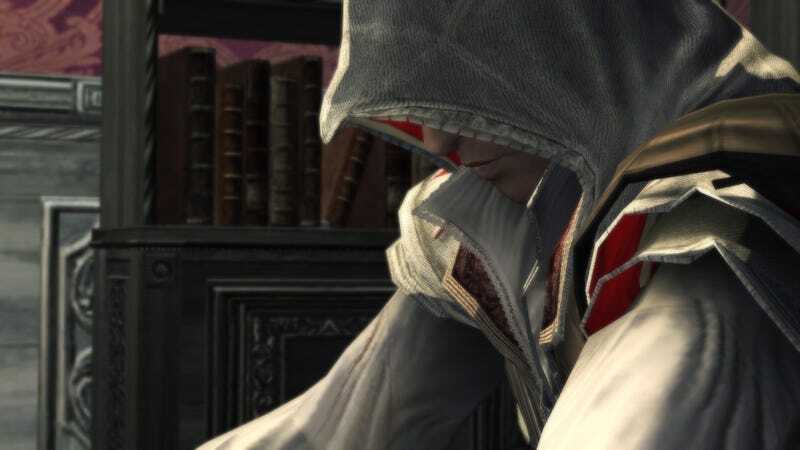 For Ezio, he loses his father and brothers and becomes an assassin. For Assassin’s Creed, the games ballooned in size, losing the focus, purpose, and economy that made Assassin’s Creed II such a fantastic experience in the first place. They’re still enjoyable games, but they lack the careful craftsmanship that made the second game a masterpiece. I hope more games learn from Assassin’s Creed II, especially the Assassin’s Creed series. A tight focus and a great purpose make for a game I will always cherish. I can’t wait for another Assassin’s Creed game that feels the same way.